Students enrolled in the CSUMB-Hartnell South Monterey County Teacher Pathway Program visited CSUMB for the first time this fall and were welcomed by the men's and women's basketball teams and Monte Rey, the sea otter mascot. The visiting students, all members of the second cohort of the new collaborative program with Hartnell College, are currently taking classes at the Hartnell College King City Education Center, but have access to resources and support at Hartnell and CSUMB. What this means for our students is really an opportunity to change the trajectory of their life. “One of the challenges is not only recruiting teachers but retaining teachers. And so one of the most effective ways to do that is to train our own. 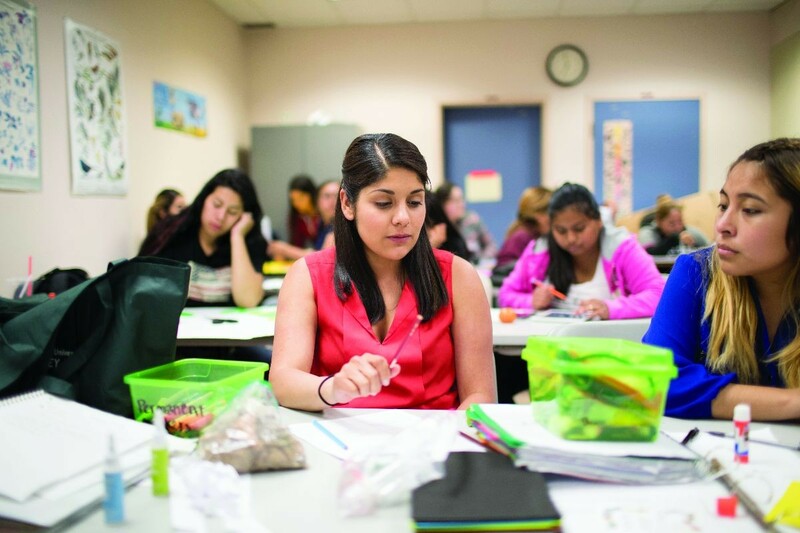 Grow our own teachers,” said Jose Luis Alvarado, dean of the College of Education at CSUMB. That local talent is being drawn from south Salinas Valley high schools including King City, Greenfield, Soledad and Gonzales. Prospective teachers Cindy Cervantes and Perla Alonso work together on a classroom assignment at Hartnell. Students in the program can take advantage of resources at both Hartnell and CSUMB, including tutoring, pre-professional workshops, priority registration, stipends, targeted academic advising and mentorship. “So what this program is, it’s basically bringing the first two years of elementary education at Hartnell College, coupled with the last two years of upper division coursework at CSUMB, and offering a liberal studies B.A., followed by an additional year for the teaching credential,” Alvarado said. The Teacher Pathway Program now serves a total of 62 students, all of whom are first-generation college students. It prepares them to make a significant and lasting impact on the quality of education that is afforded to youth in South Monterey County. “There is a commitment for all participants to actually end up with teaching positions in South Monterey County,” Alvarado said. Hartnell College and CSUMB have built the Teacher Pathway Program with an eye towards sustainability, ensuring this project continues to prepare fully qualified elementary and special education teachers well into the future. With the second cohort nearly doubling in number, the Teacher Pathway Program shows no signs of slowing down. “We’re finding that we’ll probably end up having to adjust to suit the numbers of students that are requesting to come into this program,” explained Gallardo. As successful as the Teacher Pathway Program is, approval from CSU Chancellor’s Office and the WASC Senior College University Commission is still pending.